And they all lived happily ever after. At least that’s what Disney and fairy tale books would lead you to believe. In Disenchanted! A New Musical Comedy That Gives Fairy Tales the Bird, currently playing at the Illusion Theater in Minneapolis, Snow White, Cinderella, Sleeping Beauty and their princess friends want you to know their life isn’t all Royal Balls, handsome Princes and living in the lap of luxury. 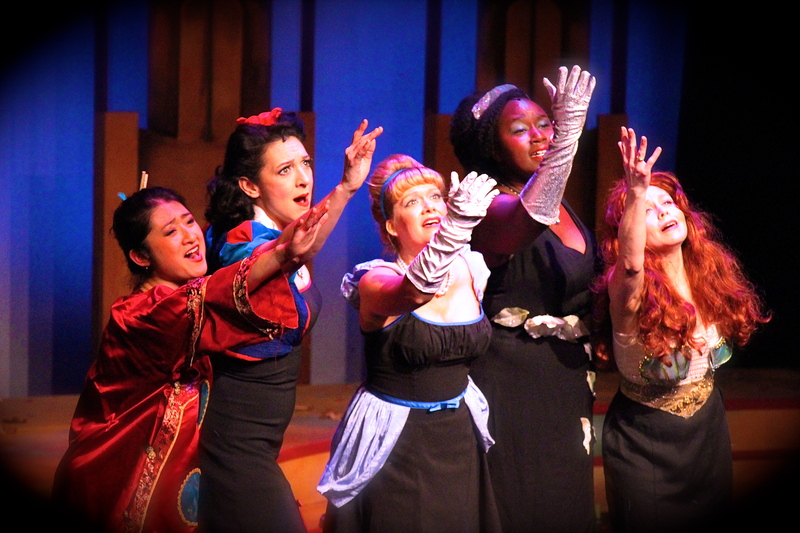 In this 90 minute musical comedy Snow White (Jen Burleigh-Bentz) emcees a variety show full of our favorite princesses fed up with the impression that their lives are a dream come true. Holding nothing back as they go after Disney for cashing in on their likenesses at theme parks, direct to video movies, toys and clothing the Princesses hope to educate their audience on the injustices they’ve faced at the hands of that world famous mouse. In “Not V’one Red Cent” Rapunzel, Snow White, Cinderella and Hua Mulan sing about the lack of compensation they’ve received for the use of their images. Poor Belle (Kim Kivens) was a simple girl with her nose always stuck in a book when we first met her. Now she’s slowly going “Insane!” thanks do those talking plates, utensils and that french candlestick holder. Cinderella (Bonni Allen) may be a princess, but she’s back in her old habit of cleaning up after everyone on stage. Bonni Allen provides some of the biggest laughs as the punchline to many of Snow White’s jokes. The Princesses are not trying to bring down the mouse that made them famous. They just want us to know how unhappy they are with the way they are being portrayed…as ditzy girls who can’t fend for themselves and need a guy to rescue them. Packed full of laughs and skits that make you really think about the images we’ve been feed about these characters Disenchanted! A New Musical Comedy That Gives Fairy Tales the Bird is a laugh out loud show perfect for a night out with your girlfriends. Disenchanted! A New Musical Comedy That Gives Fairy Tales the Bird is playing at the Illusion Theatre in Minneapolis through November 23. For more information on the show, visit their website.